so I had my install fine , really helpfull engineer , went out of his way to make sure I was happy and line / hub worked fine. Now I come home today and the download has dropped down to 2 meg but the upload remnains at 8. I read a few forums posts re training and it seemed a bit ambiguous as to whether the line needed to do this. I have been live for over a month now and I am just looking for similar experinces so when I speak to BT i have a better idea of whats going on. Ive read a few posts on how peoples profile has been throttled , is this still happening and how do you go about getting it changed ? Also , what is the best number for Infinity faults ? BT's site is the worst I have ever used to get a simiple phone number ! For your connection, the acceptable range of speedsis 16000-38717 Kbps . From the 2Mbps figure, and your "no problem" speed test, I would say you have been throttled to 2Mbps for exceeding the 300GB FUP. Have you downloaded (plus uploaded) that much? That usually stays in force at busy times for 30 days. The 300GB restriction is supposed to be being removed in April, but whether (assuming you are being capped at 2Mbps) that would uncap you straight away, or whether the 30 days would have to elapse, I don't know. 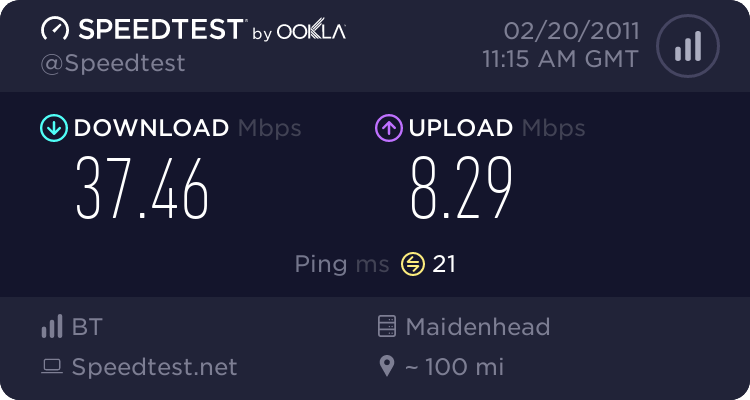 (In case anyone queries the fact the BT speed test gives full speed, it seems to me fairly likely from previous tests that it bypasses the BT Infinity in-house routers so wouldn't hit the throttle). Thats over the last month , and Im still in the 1st month. Do they reduce your bandwidth when they see you are no a high volume user ? No, unless you go over the magic number that's not the reason for your line speed. Unless they have throttled you by accident it should not be that - I would have expected to see something over 300GB on your usage stats if they had done you as a heavy user. Well I have raised a fault ticket with them , so lets see what comes back ! Hope the profile hasnt been changed , sounds like a real hit n miss scenario to get the right person on the phone !